Posted November 8, 2012 by laurielmorrison & filed under Middle Grade Literature, Posts about author visits and Skypes. As a middle school teacher, I often feel nervous about how connected everyone is in the age of the Internet and how public everything can be. I know, I know. Kind of ironic, worrying about how the Internet lets people connect and publicize their ideas on my blog. The thing is, though, drama already spreads fast enough among middle school students, and with social media, it can spread far faster and wider. Facebook, Twitter, and other social media sites make it seem totally normal to publicize every detail about your life, from what you had for breakfast to the obnoxious thing someone did to you or the reason you’re mad at your friend. It’s hard enough for adults who came of age before status messages and tweets to make good decisions about what information to keep private and what to share. But kids who are going through adolescence with all of these options for connecting and showing off and continuing conversations that aren’t going anywhere productive? Yikes. That feels like a setup for conflict and hurt feelings. But then there are times when the ability to connect online allows for some pretty awesome opportunities. 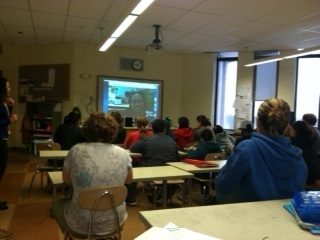 Like today, when the sixth grade at my school got to Skype with Grace Lin, author of Where the Mountain Meets the Moon (and several other wonderful books). This wasn’t my first time setting up a Skype session for students to chat with an author; in the past, some of my students have gotten to Skype with Lindsey Leavitt and Donna Gephart, and those were wonderful experiences, too. But for those events, only a couple of students had read books by the author who was “visiting” with us. Today’s Skype session was especially exciting because all of the students in the room had read and loved Where the Mountain Meets the Moon, and there’s something powerful and intimate about connecting with an author who has written a book that you love. Before the Skype session, I was stressed about the logistics—making sure the technology would work, finding a room that was open, and pulling students from another class for our fifteen-minute appointment. But once Grace’s face appeared on the white board, the conversation was easy. Students asked question after question about the book and about Grace’s career and her process of writing and illustrating. And then later in the day, we wrote thank you notes, which we’ll send along with stamped, self-addressed envelopes so that Grace can mail each student a signed bookplate. It feels kind of fitting, to have a video chat in the morning and then write old-fashioned letters in the afternoon. The whole process was a blend of new(ish) technology and good old human connection—the relatively new opportunity to see and hear each other over Skype coupled with the timeless joy of loving a book and thrill of meeting the person who created it. Pretty great, sometimes—this whole Internet thing. What a wonderful opportunity and experience for your students!